A small, residential liberal arts college in Walla Walla, Washington, Whitman College provides an education that goes beyond the classroom. Each year, Whitman alumni, parents, and friends provide more than 30% of the funding necessary to ensure the excellence of all aspects of the current and future Whittie experience. 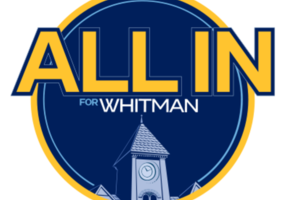 Be all in for Whitman! Join Whitman alumni, parents, students and friends to meet our goal of 750 donors to secure a $75,000 bonus gift! Make an impact at Whitman College! Connect with other Whitties on GiveCampus!